Compared with the rest of the Hispanic population in the United States, Cubans are older, have a higher level of education, higher median household income and higher rate of home ownership. While there are important differences among Cubans, particularly between those who arrived before 1980 and those who arrived in subsequent years, as a group Cubans in the United States are distinct in many ways from the rest of the Hispanic population. 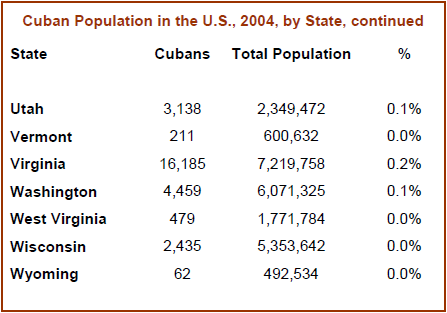 This fact sheet by the Pew Hispanic Center provides a portrait of the Cuban population in the United States. It includes the key characteristics of the population as well as results from opinion surveys conducted by the Center that shed light on attitudes held by Cubans. The analysis is based on the 2004 American Community Survey (ACS), a nationwide survey conducted monthly by the Census Bureau. 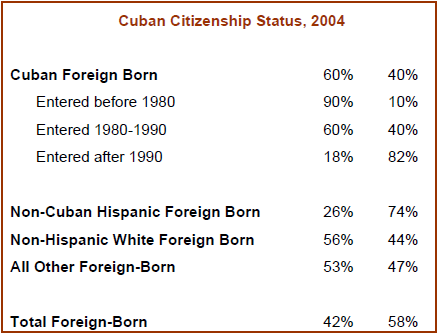 The 2004 ACS public use micro sample included 4,622 respondents of Cuban origin (2,812 foreign born and 1,810 native born). The term “Cuban” is applied to persons who identified themselves as such in responding to a question on Hispanic or Latino origins. This includes both persons born in Cuba and those born elsewhere who identified themselves as being of Cuban origins, e.g. persons of Cuban parentage born in the U.S. The terms “other Hispanics” and “other Latinos” refer to non-Cubans. Cuban immigration to the United States can be described as having four distinct waves. The first, from 1959-62, began with the departure of Cubans following the rise of Fidel Castro. The initial exodus primarily consisted of upper and uppermiddle class families in professional and managerial occupations. The second wave, from about 1965 to 1974, featured orderly departure programs administered by the U.S and Cuban governments. The so-called “freedom flights” brought middle and working class Cubans to the United States. The third wave began in 1980 with the Mariel boatlift, a chaotic exodus that was in many ways distinct from previous migrations. The Marielitos, as they are known, came from virtually every segment of Cuban society, including the poor. The fourth wave, which continues to the present, began after the collapse of Communism in 1989 and the tightening of the U.S. embargo in 1992. It includes balseros, or rafters, who float to Florida aboard improvised vessels as well as the beneficiaries of a special visa lottery system the two governments agreed to implement in 1994. Because political allegiances often determine economic and educational opportunities in Castro’s Cuba, unraveling the economic and political motivations for migration has often proven difficult. Perceptions of economic deprivation and opposition to the Castro regime have gone hand in hand for many Cuban migrants over the past four and a half decades. In contrast, most migration from the rest of Latin America, with a few notable exceptions, has been driven by economic motives. Throughout all four phases, U.S. policy has been far more welcoming towards Cubans than to any other migrants from Latin America. Virtually all Cuban migrants have been admitted under a special parole power exercised by the U.S. Attorney General that immediately grants them full legal status and puts them on a path to U.S. citizenship. Under current U.S. policy, Cuban migrants apprehended at sea are returned to Cuba while those who are able to reach U.S. soil are allowed to stay. 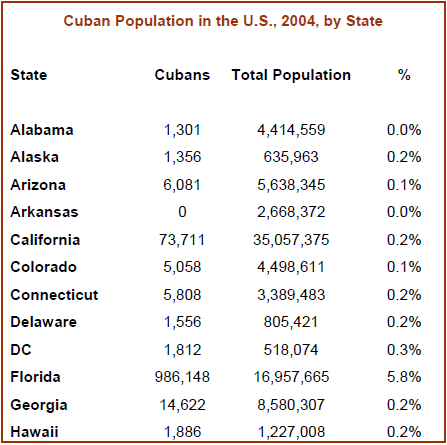 There are approximately 1.5 million Cubans in the United States. 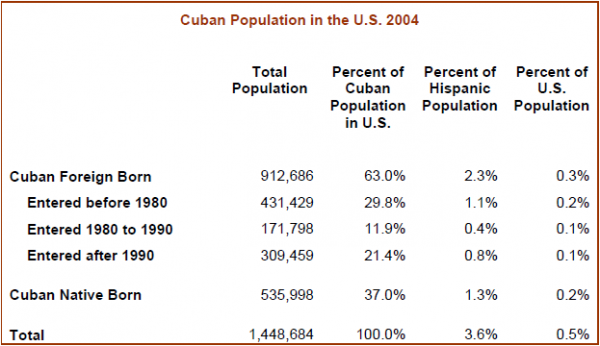 Cubans make up about 4% of the Hispanic population, which in 2004 was estimated at about 40.5 million people. More than two-thirds of Cubans (68%) live in Florida, home to about 990,000 Cubans. The state with the next highest concentration of Cubans is New Jersey (81,000), followed by New York (78,000), California (74,000) and Texas (34,000). More than a third of all Cubans (37%) were born in the United States. Among the approximately 913,000 Cubans who are foreign born, 30% entered the United States before 1980, 12% entered between 1980 and 1990 and 21% entered after 1990. Among Cubans in Florida, 70% are foreign-born. Of these, about 31% entered before 1980, 14% entered between 1980 and 1990 and 26% entered after 1990. The median age of Cubans is 41, considerably higher than the rest of the Hispanic population (27) but about the same as non-Hispanic whites (40). The median age of Cubans who entered the United States before 1980 is 63. Among those who entered between 1980 and 1990, the median age is 50 and among those who entered after 1990 it is 38. Cubans in Florida have a higher median age than Cubans elsewhere in the country (42 vs. 38). One of the characteristics of the Hispanic population is that Latinos tend to be younger than the rest of the U.S. population. But this is not the case with Cubans. Among Cubans, 29% are under 25, compared with 46% among all Hispanics and 31% among non-Hispanic whites. About 27% of Cubans in Florida are under 25, compared with 32% outside Florida. Reflecting their unique welcome under U.S. immigration policy, about 60% of Cubans are U.S. citizens, more than double the rate for other Hispanics (26%) and higher than for non-Hispanic, foreign-born whites (56%). About nine out of every 10 Cubans who arrived before 1990 are U.S. citizens. Among those who arrived between 1980 and 1990, 60% are citizens and among those who arrived after 1990 18% are citizens. Cubans are far more likely than other Hispanics to identify themselves as white when asked about their race. In the 2004 Census data, about 86% of Cubans said they were white, compared with 60% among Mexicans, 53% among other Central and South Americans and 50% among Puerto Ricans. A 2004 report by the Pew Hispanic Center concluded that Latinos who identify themselves as white and those who say they are some other race have different characteristics. Survey data also show that Latinos in these two groups have different attitudes and opinions on a variety of subjects. Hispanics who identify themselves as white have higher levels of education and income and than those who choose “some other race.” The report said the findings suggest that Hispanics see race as a measure of belonging and “whiteness” as a measure of inclusion, or perceived inclusion. The Pew Hispanic Center’s 2006 National Survey of Latinos asked respondents whether they consider the United States or their country of origin to be their real homeland. More than half (52%) of Cubans said they considered the U.S. their real homeland, again significantly higher than Mexicans (36%), Central and South Americans (35%) and Puerto Ricans (33%)—the latter U.S. citizens by birth. The median household income for Cubans is $38,000, higher than for other Hispanics ($36,000) but lower than for non-Hispanic whites ($48,000). 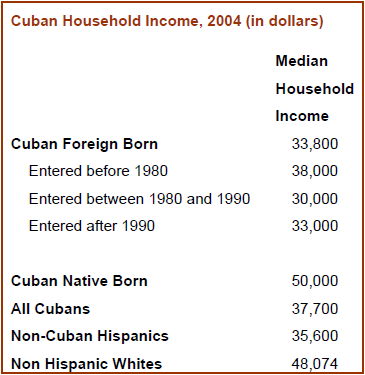 Nativeborn Cubans have a higher median income than non-Hispanic whites ($50,000 vs. $48,000). Among foreign-born Cubans, those who arrived before 1980 have the highest median income ($38,000). However, those who arrived between 1980 and 1990 have a lower median income compared with those who arrived in 1990 or later ($30,000 vs. $33,000). Cubans living outside Florida have a higher median income than those living in Florida ($44,000 vs. $36,000). 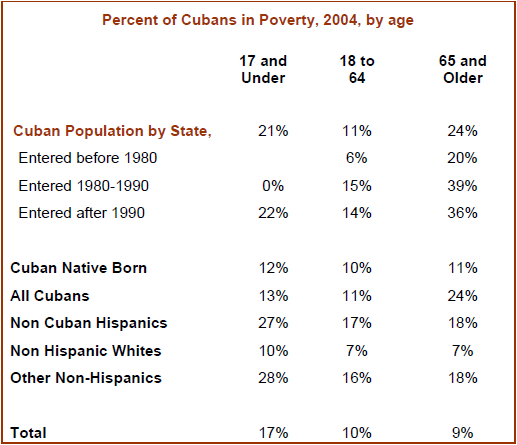 Poverty rates for Cubans are generally lower than for other Hispanics, with some notable exceptions. About 13% of Cubans under 18 are in poverty, less than half the rate for other Hispanics (27%). About 11% of Cubans between 18 and 64 are in poverty, also lower than among other Hispanics (17%). However, older Cubans, those 65 and above, have considerably higher poverty rates than Hispanics or non-Hispanic whites. (24% vs. 18% and 7%, respectively). The poverty rate is greater among foreign-born Cubans 17 and younger (21%) and 65 and older (24%) compared with those who are native born (12% and 11%). However, among those ages 18 to 64 the poverty rate is similar between both the native-born and the foreign born (10% and 11%). About 61% of Cubans own their home, compared to fewer than half of all other Hispanics (47%). Among non-Hispanic whites, about three quarters (74%) own their home. 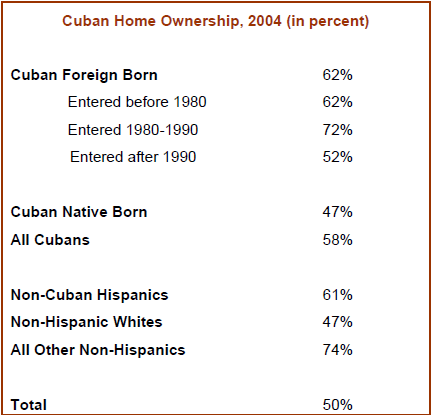 Cubans who are foreign born have a higher rate of home ownership than those who are native born (62% vs. 58%). Among foreign-born Cubans, the highest rate of home ownership is among those who entered before 1980 (72%). More than half (52%) of foreign-born Cubans who entered between 1980 and 1990 own their home, while fewer than half (47%) of those who entered after 1990 own their home. Cubans living in Florida have a higher rate of home ownership than those living outside the state (65% vs. 52%). One out of four (25%) Cubans 25 and older is a college graduate, more than double the rate among other Hispanics (12%) but lower than among non-Hispanic whites in the same age group (30%). Among native-born Cubans 25 and older, 39% are college graduates compared with 22% among foreign-born Cubans. Cubans 25 and older who entered the U.S. between 1980 and 1990 have the lowest graduation rate among foreign-born Cubans, 13%, compared with 24% for those who entered before 1980 and 26% for those who entered after 1990. Almost half (49%) of all Cubans 25 and older are high school graduates, a slightly higher rate than among other Hispanics in the same age group (47%) but lower than non-Hispanic whites (59%). 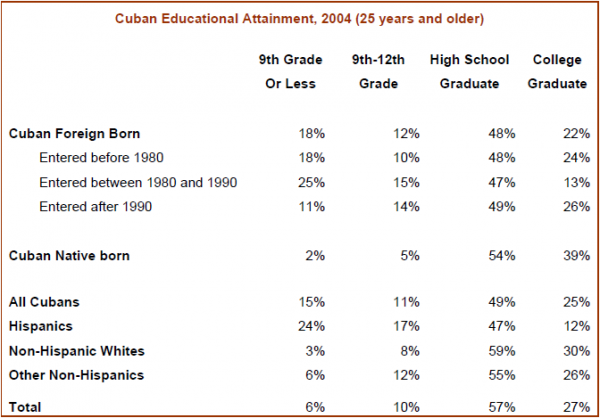 Among native-born Cubans 25 and older, 54% are high school graduates, a higher rate than among foreign-born Cubans (48%). More than two-thirds (69%) of Cubans under 18 speak a language other than English at home, about the same as other Hispanics (67%). Among those 18 and older, about 89% of Cubans speak a language other than English at home, a higher rate than among Hispanics (80%). Among native-born Cubans, almost two-thirds (64%) speak a language other than English at home. About 12% of Cubans under 18 speak English less than very well, compared with 20% among other Hispanics. Among Cubans 18 and older, 49% speak English less than very well, slightly higher than among other Hispanics (46%). About 40% of foreign-born Cubans under 18 speak English less than very well, a higher rate than among other Hispanics (20%). 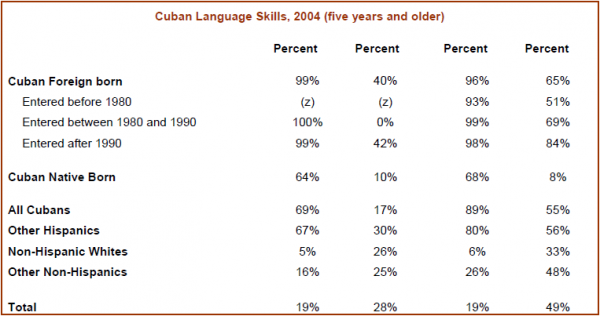 Among Cubans 18 and older who entered before 1980, 48% speak English less than very well. Among those who entered between 1980 and 1990, 68% speak English less than very well, and among those who entered after 1990, 82% speak English less than very well. In 2004, more than half of Cubans (52%) 15 and older were married, about the same as other Hispanics (51%) but lower than non-Hispanic whites (57%). Foreign-born Cubans 15 and older in 2004 had a far higher marriage rate than native-born Cubans (58% vs. 36%). Among foreign-born Cubans in the same age group, 61% of those who arrived before 1980 were married, compared with 55% for both those who arrived between 1980 and 1990 and those who arrived after 1990. In 2004, 12% of Cubans 15 and older were divorced, higher than among other Hispanics (7%) and about the same as non-Hispanic whites (11%). In 2004, a quarter of all Cubans had never married, compared with 35% of other Hispanics and 24% of non-Hispanic whites. Registered voters who trace their origins to Cuba make up 6% of the Latino electorate. In the 2006 National Survey of Latinos, 28% of Cubans said they considered themselves Republicans, more than Mexicans, (15%), Puerto Ricans (11%) or Central and South Americans (7%). About 20% of Cubans considered themselves Democrats, fewer than Puerto Ricans (50%) or Mexicans and Central and South Americans (29%). More than a quarter (27%) of Cubans considered themselves Independents, slightly higher than Mexicans (25%) and higher than Puerto Ricans (15%). Among Central and South Americans, 34% considered themselves Independents. Surveys conducted by the Pew Hispanic Survey probe Hispanic attitudes and views on many issues. In these surveys, Cubans also emerge as a distinct group from the rest of the Latino population. 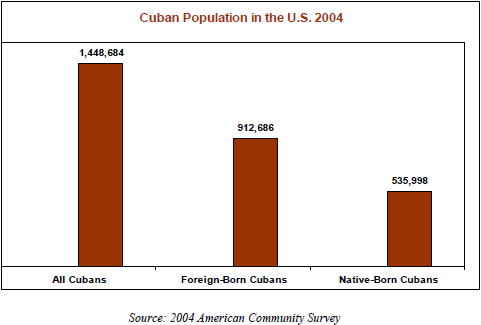 In the 2006 National Survey of Latinos, for example, Cubans were less likely to see the debate over immigration as heightening discrimination against Latinos, compared with other Hispanic sub-groups. Among Cubans, 45% said discrimination was a major problem, significantly lower than Central and South Americans (65%), Puerto Ricans (59%) and Mexicans (58%). And while a majority of Hispanics said Latinos from different countries were working together to achieve common political goals, Cubans, along with Puerto Ricans, were a notable exception. Cubans also are less opposed to abortion than other Hispanics. Mexicans, Puerto Ricans and Central Americans are more likely than Cubans to say that religion is the most important thing in their lives. Cubans are also less likely to attend religious services regularly. In the 2002 National Survey of Latinos, conducted with the Kaiser Family Foundation, about 28% of Cubans said they attend religious services once a week or more, a lower rate than among most other Hispanics. Cubans also tend to have a more positive view of the federal government and are more inclined to identify with the United States as their homeland. In the 2002 survey, about two-thirds (64%) of Cubans said they trusted the government in Washington to do what is right just about always or most of the time, higher than Mexicans (43%) or Puerto Ricans (38%). Surveys conducted by the Institute for Public Opinion Research and the Cuban Research Institute of Florida International University (http://casgroup.fiu.edu/cri/pages.php?id=1696) shed light on the attitudes of the U.S. Cuban population in South Florida, which as noted is by far the largest in the country. In the most recent survey, conducted in 2004, a majority of Cubans (56%) supported dialogue with the Cuban government, an increase from 40% when the first poll was conducted in 1991. While Cubans in general have low expectations about imminent change in Cuba, in 2004 more than one-in-four Cubans expressed optimism in this regard, compared with 16% in 2000. The number of Cubans who said they were very likely or somewhat likely to return to Cuba if there were a democratic government decreased from 41% in 2000 to 32% in 2004.